The Calgary Kookaburras are one of the more progressive clubs abroad, especially for women playing the game. The club under the guidance of ex-Aussie Jake Anson have set a high bar when it comes to development and player participation. Taking two teams to the US nationals gives more girls exposure to the game at a higher level, Jake also has plans to take on board a development coach from Australia in 2010 to help raise the skill level in this Canadian club even more. In a fitting end to the 2009 season, the club travelled north for the inaugural Battle of Alberta game versus the Edmonton Emus and escaped with a narrow win. The Emus fielded their strongest squad yet and showed how much they have improved in being first to the ball and holding their structure, causing problems for the Kookaburras midfield. Edmonton coped with 12-a-side footy better and led by 7 points going into the first change. Calgary coach Jake Anson was animated during the break and urged his girls to get first use of the ball and to provide better movement up forward. The Kookaburras responded in the second quarter, kicking two goals to go into half-time with a 7-point lead, despite losing key forward Lori Bossert with a broken finger. Edmonton lifted a gear in the third, throwing themselves at the contested ball and attacking relentlessly, until a knee injury sent Emus ruckwoman Neda Dalili to hospital. Erin Leblanc and captain Steph Tooke kicked goals for the Emus, but Calgary responded through Beck Jones and Vicki Hewitt to lead by 12-points at three-quarter time. Edmonton coach Tristan Waldock used the break to ask his charges for one final quarter of polished football, but Calgary used the wind to their advantage and capped off a hard-fought win with a Kate Ross goal on the siren. Goals Calgary: Ross 2, Scanlon 2, Jones, Hewitt. Goals Edmonton: LeBlanc 2, Tooke. Best Calgary: Zakus, Ross, Scanlon, Hewitt. Best Edmonton: LeBlanc, Galick, Tooke, Norsworthy. 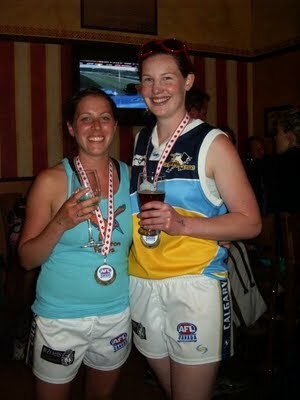 AFWL Best & Fairest (tie): Lori Bossert (Hillhurst) & Kathryn Zakus (Kensington). AFWL Rising Star: Sarah Eddie (Hillhurst). AFWL Top Goalkicker: Kathryn Zakus (Kensington - 18, pictured). All-Alberta Squad: Lori Bossert, Sarah Eddie, Caitlin Kidd, Alicia Scanlon, Lyndsay Smith, Lesley Zmurchuk (all Hillhurst); Rebecca Jones, Vicki Hewitt, Char Olm, Kate Ross, Kathryn Zakus (all Kensington); Neda Dalili and Marie Galick (both Edmonton). Calgary backed-up on September 24 in a final intra-club night match. Calgary White stole a narrow victory over Calgary Blue and the coaching panel would have taken a lot away from the game to assist in the selection of US Nationals squads. Calgary Kookaburras wrapped up the year with a trip to the US Nationals in Mason, Ohio. This year as part of the club development goals they sent two squads to the tournament, giving more girls exposure of highly competitive matches. Mason, Ohio, was the third US Nationals tournament that they have participated in. At Louisville in 2007, they partnered with Baltimore-Washington to field a team, and lost games against Arizona/Denver, Milwaukee and Atlanta. Last year they visited Colorado Springs and won the tournament after defeating Milwaukee, Arizona, Denver and Atlanta in the final. It was a Cinderella story for the club and an experience that was celebrated long afterward. Calgary's aim is to build a bigger club that gives all girls the best chance to enjoy their footy and improve their skills. They have a 'one club, two teams' structure for tournaments. This year, the coaches selected two strong teams with enough skill to give US Nationals a red-hot go. Testament to this is the fact that both squads boast Northern Lights and All-Alberta Team representatives. Prior to the tournament Club captain Kathryn Zakus says "We've seen a lot of changes around the club over the past year, with a lot of new girls trying footy for the first time. Eleven of the girls who won US Nationals with us last year aren't returning this year for various reasons, so we don't know how we will go. Plugger (Amanda O'Rae), Ginger (Meg Goodfellow) and Mumf (Kathryn Mumford) especially will be big losses, as they were all in our starting side. Vice captain Holly Greatwich (pictured) adds "I got hurt during pre-season, so I haven't had the smoothest year. I think I played seven games and missed about ten, and it was frustrating to sit on the sidelines with our other injured girls and just watch. I'm really looking forward to my first Nationals as a 21-year-old, and all the fun and partying that that will entail. I'm really stoked that we're sending two teams, and I'll be supporting Calgary White as loudly as I can from the sidelines. We are fortunate to be joined in Mason by three girls from other western Canadian clubs. Lauren Mantei and Katie Nanka from WestCoast and Amanda Layther from Edmonton will be warmly welcomed into the Calgary fold for a fun weekend of footy. We also have Debbie Mantei from Vancouver and Adrienne Anson from Warrnambool (Australia) joining us as guest Team Managers for the weekend. Calgary Blue played well, and made it to the final against the Milwalkee Lady Bombers. The Bombers had the benefit of 6 players who were in the USA team that recently travelled down under, and their experienced showed as they won the eight-team tournament, beating Calgary Blue 8.3 (51)-1.5 (11), in the championship game. Plans are well in place for many of the Calgary team to represent Canada in the second international against the USA freedom, and on home soil in Toronto in July, they wont be taken lightly.